Muxlab 500219 gör det möjligt att ta emot en analog ljudsignal upp till 1000 meter över en Cat5e/6 kabol om den kopplas ihop med en 500028, 500028-F eller Muxlabs 8x8 audio matrix ( 500210 ). Denna lilla burken kan då släppa ut 30 W till 2 st 8 ohm högtalare. Med hjälp av vredet på framsidan kan man steglöst ställa volymen. 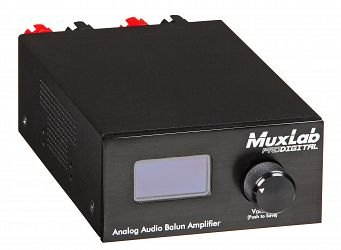 The MuxLab Analog Audio Balun Amplifier allows one (1) analog audio source using one of the MuxLab Hi-Fi Audio Baluns to feed a compact 30W per channel stereo Class D Amplifier using a single Cat5e/6 cable to distances of up to 3,250ft / 1km. With a simple OSD showing graphical input level (left & right) and volume level. Push and turn button on front of unit for power on/off and volume. 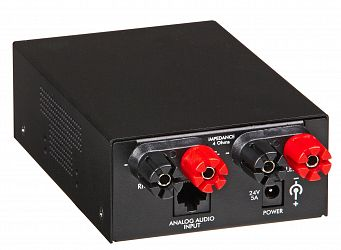 Compatible with MuxLab transmitter baluns: 500028, 500028-WP-US, 500028-WP-UK, or 500028-F: or the MuxLab 8×8 Line Level Audio Matrix Switch (500210).